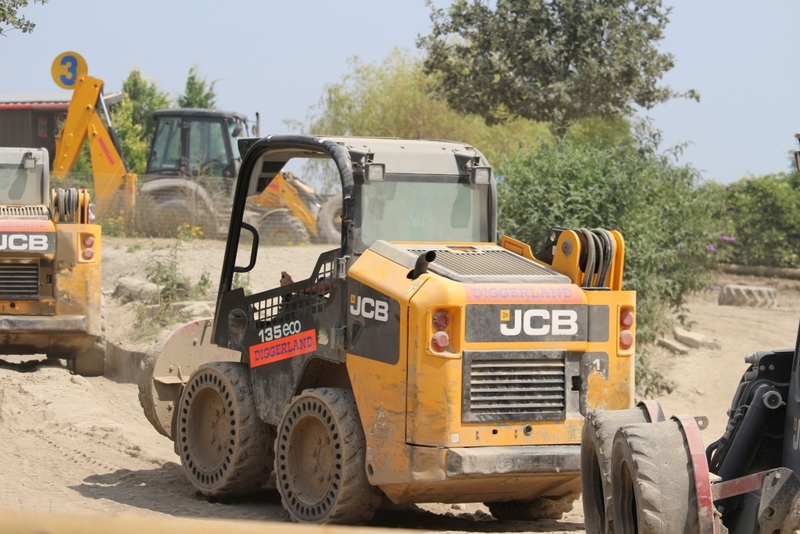 Diggerland in Strood, Kent is a place we’ve been waiting to visit for a while. My son (a big fan of construction vehicles!) is quite short for his age and has taken forever to hit 90cm – the minimum height for going on any of the diggers. Finally he did, and so a week after his third birthday we went along to see whether he would, er, dig it. Unfortunately, on the day we were due to visit it happened to be the hottest day of the year so far. Hopeful that there might be at least some bits that were undercover we made the short trip anyway, however aside from the restaurant and picnic area, soft play and the bumper cars (which cost extra) there was barely any shade to be found across the whole park. After queuing for a while at the entrance, we made our way to the top of the park. 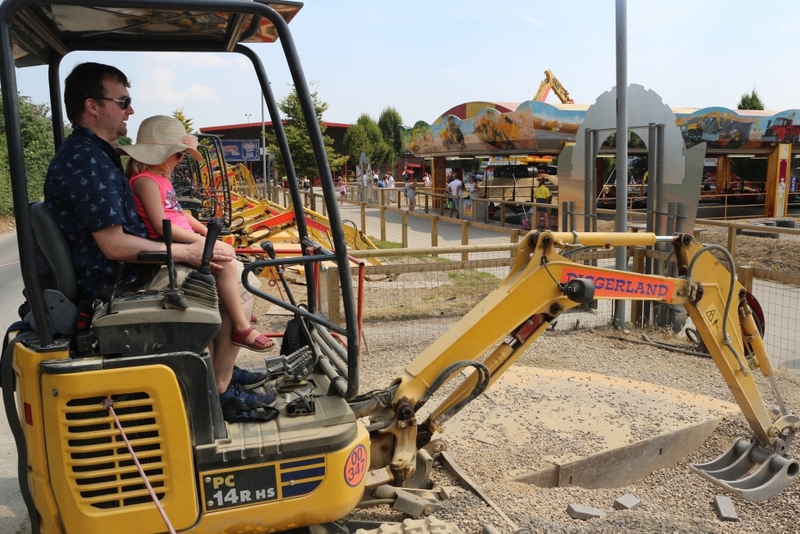 There we went on the Diggerland Train which takes you around the edge of Diggerland. Even with factor 50 sun cream on we were already starting to go red. We had a very early lunch and slathered on more sun cream before heading back into the main park. 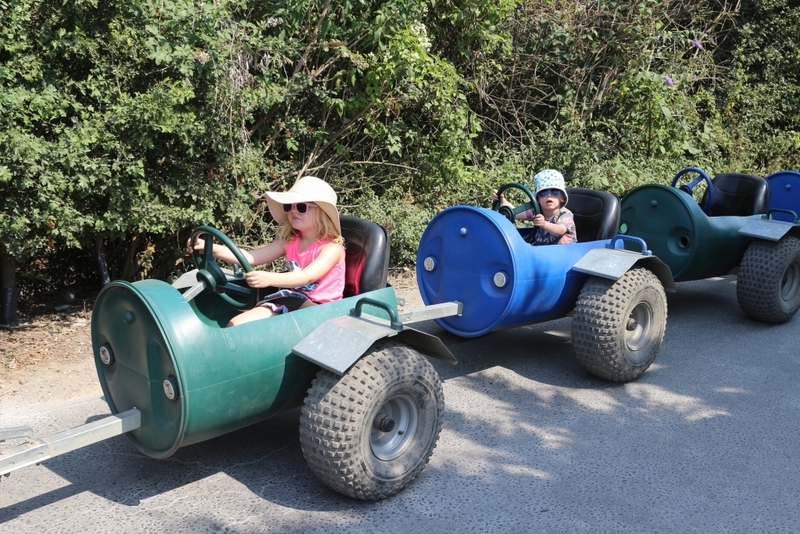 I went on the Spindizzy ride with my oldest – as the name suggest it spins you around – which was fun and she really enjoyed, although the black seats and the safety restraints were almost too hot to touch and I wouldn’t have done it later in the day. The children had a go on one of the mini jeeps. My oldest is over 100cm and could drive but my youngest was only tall enough to sit next to her. My husband had a go at catching ducks with a JCB which he was pretty bad at (sorry). Sadly I didn’t get to drive anything, which I was quite looking forward to; the thought was just too much and then when one of the kids went a bit clammy I thought best to cut it short and get them indoors where we killed an hour in soft play before giving up and going home. 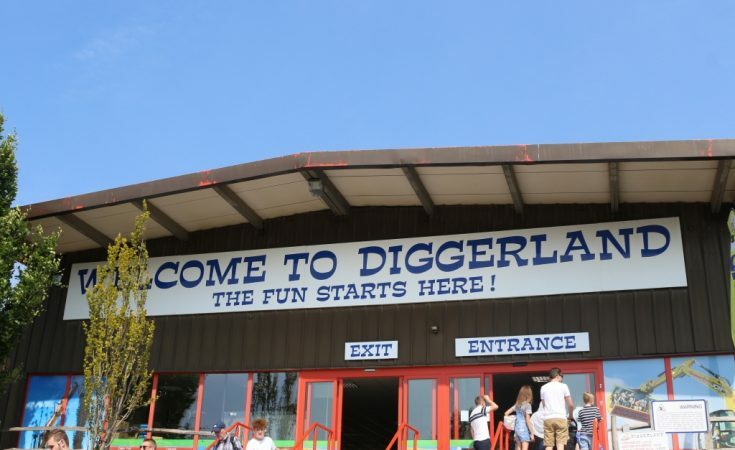 Due to the short amount of time spent there, we didn’t really get a proper feel for Diggerland and therefore I don’t really feel qualified to give a proper review. 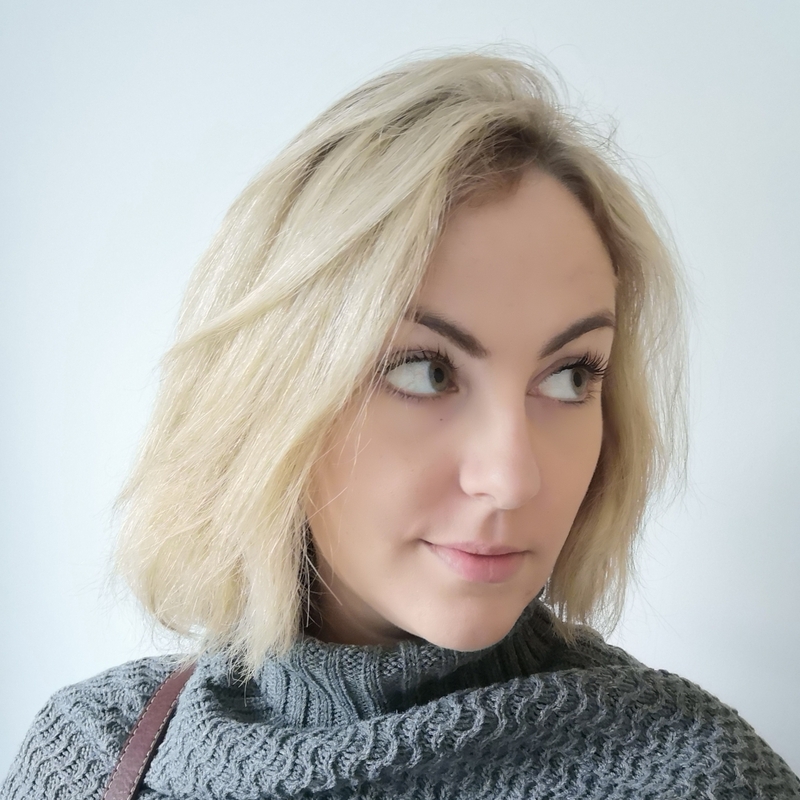 I did offer to go back on a different date so that I could write something a bit more comprehensive but was asked just to go ahead based on our trip. To be honest, I don’t think that based on our experience that the children would really want to go back as they were hot and bothered and dirty from the dust, and wanted to go home as much as we did. 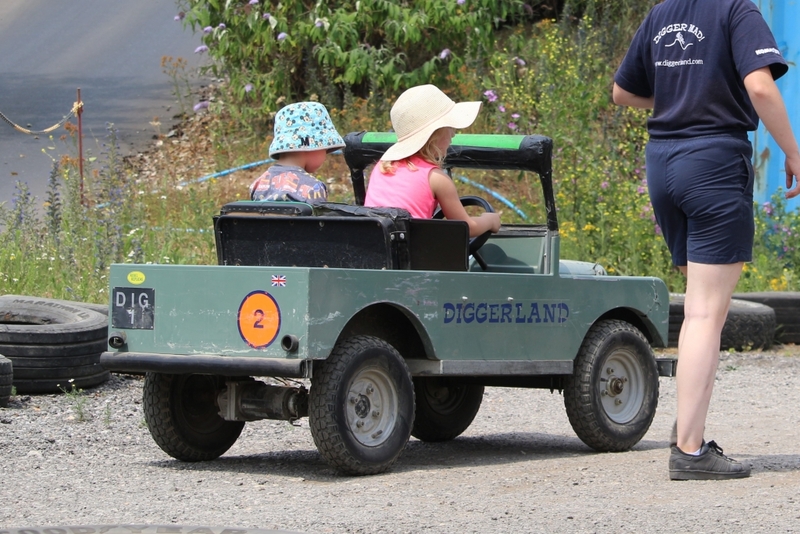 Although it obviously wasn’t the fault of Diggerland, the attraction isn’t really set up for the heat. It certainly gave me a new sympathy for construction workers. I am sure that it’s a nice day out for a digger-mad child, especially when they hit 6/7ish and are old enough to do the driving for themselves. 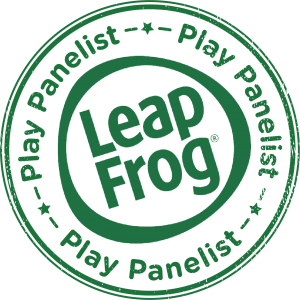 Something to consider though; if you have more than one child and one or more of your children are younger then make sure there is an extra adult with you, as in general, if they are under 110cm (like my quite tall 4.5 year old) they’re likely to need accompanying on the majority of things 1:1. Any child under 80cm won’t be allowed on the rides and up to 90cm would be very limited. You can see the height chart here. However, I would say that based on my experience it’s definitely not one I would recommend for the middle of the summer; I’d stay in the cool and watch a film instead! Maybe they could consider some kind of digger-themed sand and water park for the rare summer days when it’s Just. Too. Damn. Hot. 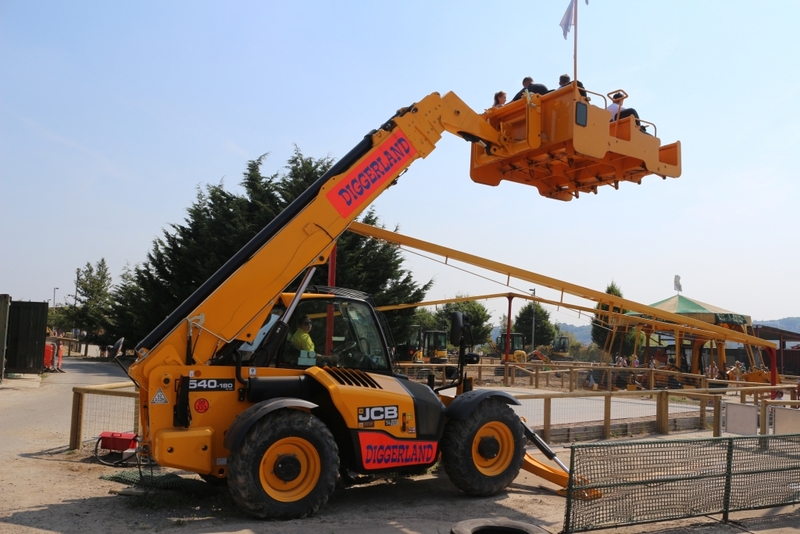 Entry to Diggerland Kent is £19.95 or £16.99 if you pre-book online. It’s open over holidays and weekends during peak periods. 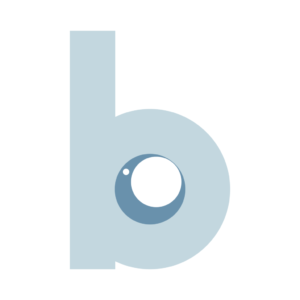 See the opening times on their website here. We were given free entry for the purposes of this review.